The sensory cells of the eye are an extension of the brain, budding out from the brain during fetal development. The eye shows less growth than any other organ between birth and adulthood. The eye is sensitive to light, which is focused through the cornea and the lens onto the retina at the back of the eye. The retina contains 137 million cells, of which 130 million are rod-shaped and used for black and white vision, sensing movement and seeing in poor light, while seven million are cone-shaped and used to sense colour and pattern in bright light. Cones are concentrated in the parts of the retina called the fovea centralis (central depression) and the macula. A network of nerve cells on the surface of the retina changes the light signals into electrical nerve impulses and then relays them to the brain via the optic nerve. The eye contains 70 percent of the body’s sensors and can deal with one and a half million simultaneous messages. The pupils automatically dilate or contract to control the amount of light that falls on the retina. Light rays enter the eye through the pupil and are focused by the lens. The image that falls on the retina is transmitted to the brain via the optic nerve. Light rays reflected from an object are partly focused by the cornea before entering the eye through the pupil. The image is focused further by the lens onto the retina, where it appears upside down. Electrical signals from the retina transmit the image to the brain, which interprets it as upright. The human eye is more efficient at accommodation (ability to resolve fine detail) than the eyes of most mammals. Light enters the eye through the pupil, which dilates or constricts according to lighting conditions, lens adjustment and emotions. The lens then focuses the light on the retina by changing shape. 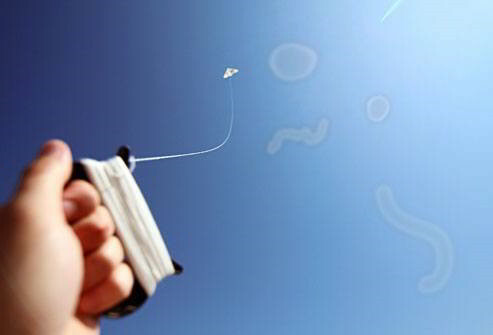 When focusing over long distances (over 7m/20ft), the lens is at its flatest and thinnest. When focusing on near objects, the lens becomes rounder and thicker. The closest point at which the eye can focus varies with age – from about 7cm (3in) in infancy to only 40cm (16in) in old age. The lens focuses an image upside down on the retina; the conscious mind interprets the image and “sees” it in its true position. 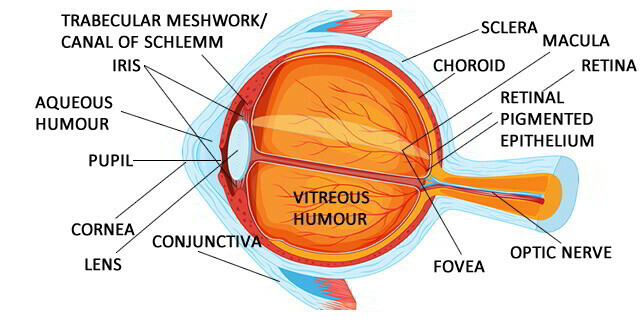 The eye’s strength of accommodation is determined by the number of light receptors (rods and cones) present in the retina, and how closely they are packed together. We have 200,000 receptors/mm2, giving excellent resolution as long as vision during infancy has not been impeded in any way. Some creatures have an even higher resolution – the buzzard’s retina, for example, contains one million receptors/s/mm2. Since our eyes are placed on the front of the head we have binocular (three dimensional, or 3D) vision. Binocular vision means that we can see through 180° without moving the head, with an overlap of 90° between the right and left visual fields. This enables us to judge distances and pick out detail, and improves the sensitivity of vision when light is poor. In response to light, the rods and cones in the retina produce electrical signals that trigger impulses in the nerve cells to which they connect. These impulses travel along the optic nerve to the brain. Pigment cells behind the rods and the cones prevent reflection of light within the eye. The eye is a complex organ made up of several highly specialized components. Many eye disorders do not threaten sight, but a few serious conditions such as glaucoma may damage the eye and lead to loss of vision. A few eye disorders, such as conjunctivitis, are very common and early diagnosis usually leads to successful treatment. I’ve chosen to start with the condition that is most common, floaters, because virtually all of us will get them and they are nothing to worry about. Other common problems, such as styes and squint, mainly affect children and you will find them in the childhood section. Several conditions, including glaucoma, can cause “red eye”, the most common being conjunctivitis due to an infection, which is easily remedied with local antibiotics. Glaucoma, both acute and chronic, is an eminently treatable condition but left undiagnosed and untreated can cause serious loss of vision, so I give both forms prominence in this section. It’s quite common to see small specks that appear to float in the field of vision. Although floaters seem to lie in front of the eyes, they are in fact fragments of tissue in the jelly-like fluid that fills the back of the eye. Floaters move rapidly with any eye movement but when the eyes are still, they drift slowly. in large numbers or interfere with vision. In an older person or in someone with pre-existing eye problems a sudden increase in the number of floaters, which may be combined with the sensation of flashing lights, could indicate a serious eye disorder that requires urgent treatment, such as the separation of the retina from the back of the eye (retinal detachment).